A lucky bamboo gift for our dear customers, along with best wishes for 2013! Land Impact of 4, with optional floor shadow. Now available on -Hanaya- in-world groups, Subscribe-O-Matic history, as well as at our store. 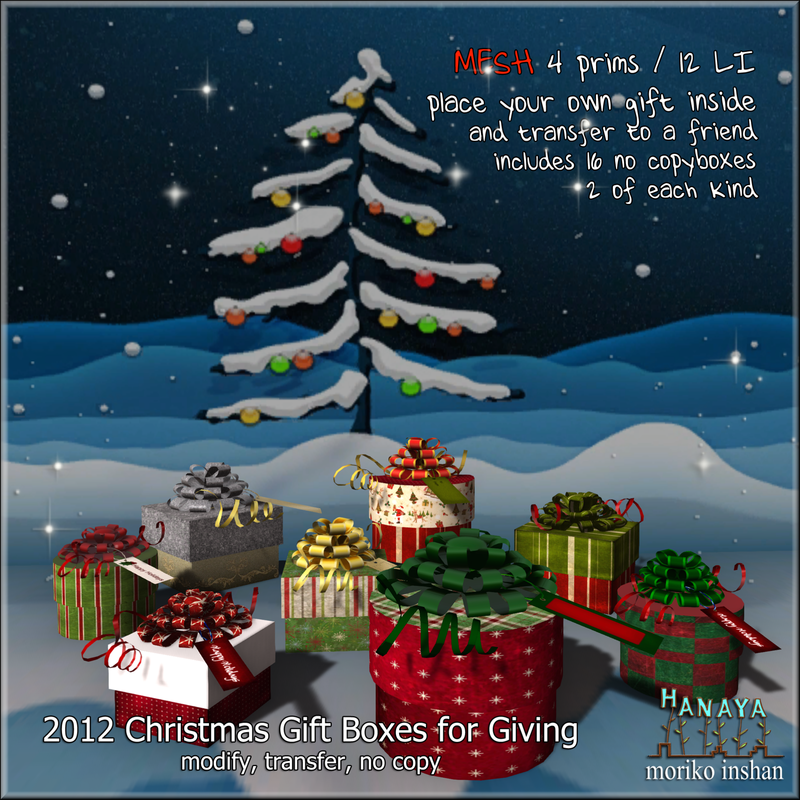 This entry was posted in Freebies and Gifts on December 29, 2012 by moriko. on behalf of the whole -Hanaya- team, I would like to wish you the very best in the New Year, and hope that you have a safe, happy and fun festive season. Thank you very much for your support over the last year – without you, there would be no reason for -Hanaya- to continue. And let me take a minute to introduce my team, who help make things happen, and keep me sane. Yuukie Onmura – my bestest friend, inspiration and real life spouse, the person that makes me whole. Oh and she does QA, thank God. Lance Corrimal, dear brother-in-law who does scripting when I get out of my depth. Lance is the face and brains behind the Dolphin Viewer – an awesome TPV that is great for building, uploading mesh, taking pictures + machinima, and of course sailing. Lapis Corrimal – my twin, my clone, my sister, myself. She is the go-to person on my friend list when things get too busy and hectic. She lets me blow off steam and have just plain fun. And speaking of fun, the 4 of us will be on vacation from December 21st through January 4th. If you need to contact me, please do so via a detailed IM. Altough I will have somewhat limited access to Second Life, I will try to get back to customer assistance requests as soon as possible. This entry was posted in Chit Chat on December 20, 2012 by moriko. Today is a day to give back a little something to loyal -Hanaya- friends and customers to thank you guys for your support and encouragement over the last 12 months. First, a little gift for the girls – teeny little mesh Gift Box Earrings. And yeah, that is me modelling them in my Edelweiss Santa dress and reindeer horns. And since we have a few guys in our various groups who may not want to wear them, if you IM me in-world, I will pass you a no copy/transfer version so you can give it as gift to your fave girl. This is the third Christmas that -Hanaya- has been in operation. And each year, we have new gift boxes – ones that you can stuff your own gift into and pass to a friend or loved one. The pack contains 4 round and 4 square gift boxes and there are 2 of each included – so you get a total of 16. This year’s gift boxes are, as usual, for sale @ -Hanaya- in-world and on the Second Life Marketplace. As well, a set will be sent out on the -Hanaya- Yummy Collectibles in-world group. Lastly, please note that we will be on vacation from December 24th to January 2nd, and will only have access to Second Life and email via iPhone. This entry was posted in Freebies and Gifts, News, Product Announcements on December 14, 2012 by moriko. Your personal elf, Moriko Inshan, has been hard at work making Christmassy + wintery things in her North Pole workshop. Now the workshop is decorated, and open to the public – yay! When you arrive at -Hanaya- in-world location, just follow the signs to the garden behind the main store. All new items are also available at this year’s SL Christmas Expo. The Christmas shop has demos of all our new releases for you to try, along with our favourite Christmas and winter things all in one cute place. Feel free to linger and take some pics in the garden. The first thing to try is our Old Fashioned Christmas Tree – click the tree to bring up the texture change menu to alternate between a light and dark wood finish on the wooden angel tree topper. Or change the textures on the tree skirt. The menu also contains Access Control, so you can decide who can play with your tree. Please note that all elements of the tree (except the candles) are mesh, so if you increase the size, the land impact will increase accordingly. I am Canadian, so I love hanging outside in cold snowy weather. 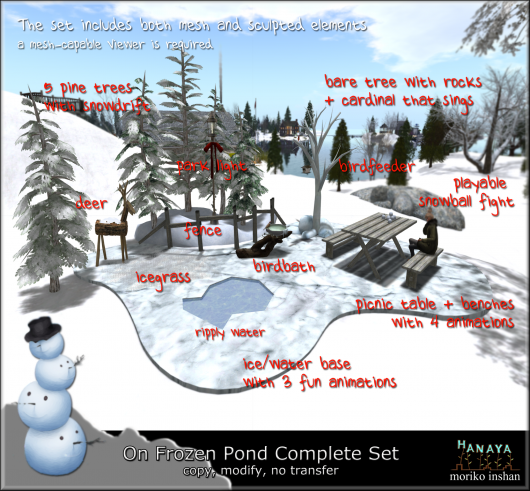 For those of you who like that as well, we have 2 new products in our On Frozen Pond collection. 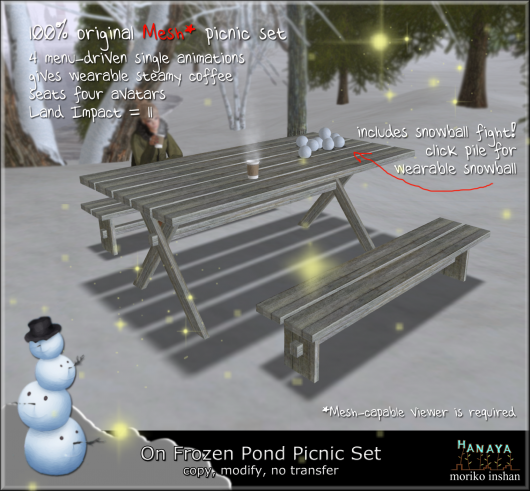 First is the On Frozen Pond Picnic Set – a mesh table and benches with 4 menu-driven single animations that seats up to four people. My fave animation is the one that gives you hot steamy coffee. Or click the pile of mesh snowballs on the table to get a throwable snowball. Just wear it, go into mouselook, aim at your friends, throw and watch it go SPLAT! 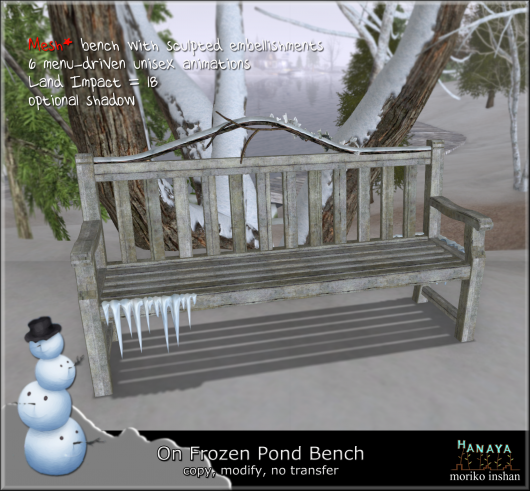 Another part of the On Frozen Pond collection is a mesh park bench embellished with sculpted elements like frozen ivy leaves, snowy branches and icicles. The bench contains 6 menu-driven, adjustable unisex animations and seats either 1 or 2 avatars. 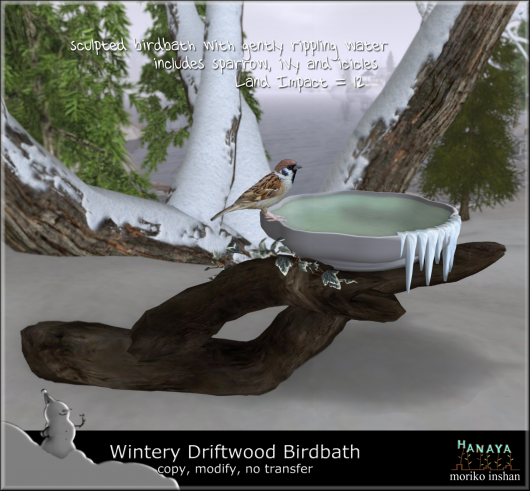 In response to customer queries, our Driftwood Birdbath is now available in a wintery version. With it’s frosty ivy leaves and icicles, it will provide much needed drinks to your feathered friends throughout the winter. And birds appreciate a birdbath in winter, since they do not have to waste energy on melting snow to drink. We have packaged up some of the new releases into one big set, and have placed them into a one-of-a-kind wintery scene, jam packed full of goodies, many of which are hand-crafted mesh created in our workshop for this project. 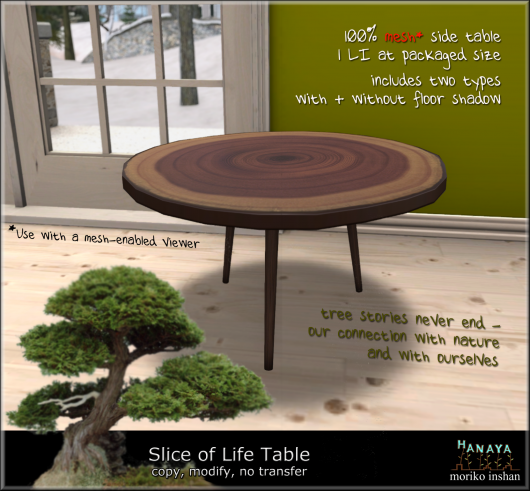 All of the new releases in this blog post are available for demoing and purchasing at -Hanaya- Christmas Shop, as well as at this year’s SL Christmas Expo. We are located on Xmas Expo 1. Second Life Marketplace availability in a few days, as time permits. This entry was posted in Events, Product Announcements and tagged -Hanaya-, Christmas, winter on December 8, 2012 by moriko. 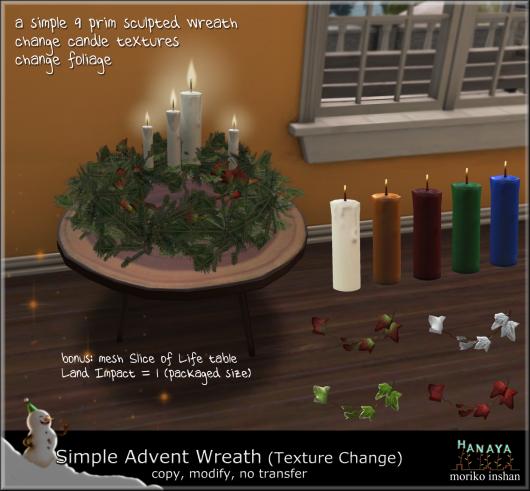 Tomorrow is the 1st Sunday in December, so it seems timely to tell you about a new release from -Hanaya- for this Christmas – the Simple Advent Wreath. The sculpted wreath is 9 prims and consists of a simple pine wreath with ivy and 4 candles, which you can click on/off individually. Why individually? Well in Germany, and likely in other countries, it is the custom to have an advent wreath with 4 candles, where each candle symbolizes one of the 4 Sundays before Christmas. On each of those Sundays, you light a new candle on that day. 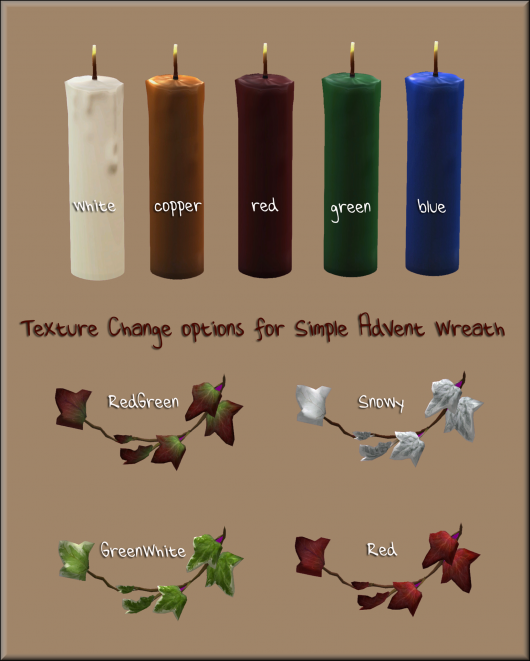 Our Advent Wreath is texture change, so that you can best match the colour of the candles and the ivy to your liking. Simply click anywhere (except the top of the candles), and a menu will pop up that allows you to change the textures. A single version (without texture change), is the December group gift for our VIPs on the -Hanaya- Yummy Collectibles in-world group. Grab it from the group notices or stop by the Customer Service area of our store. Another new release for today is a 1 Land Impact side table that we call the Slice of Life – 100% mesh with optional floor shadow. Deceptively simple, this little table is a must-see to appreciate the lines, shape and texturing. I was so happy with how it turned out, I included the table as a bonus with the Simple Advent Wreath. But you can buy it separately too. 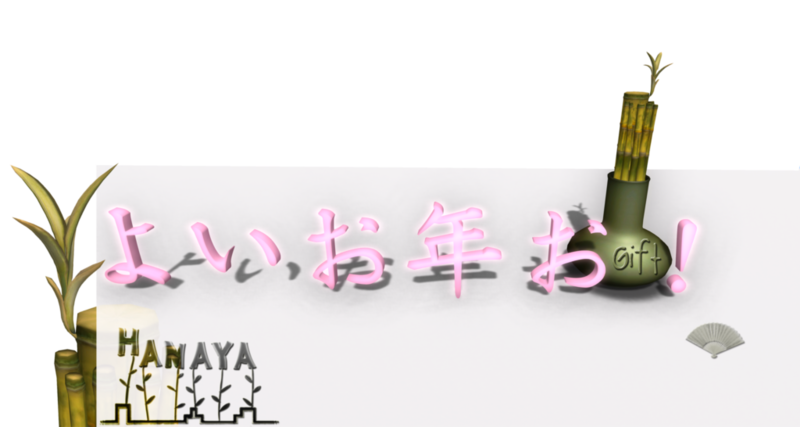 As always, all our new releases are modify, copy for your convenience, and are on display and available for purchase at -Hanaya- in-world store and soon on our web store on the Second Life Marketplace. Enjoy your first December weekend! 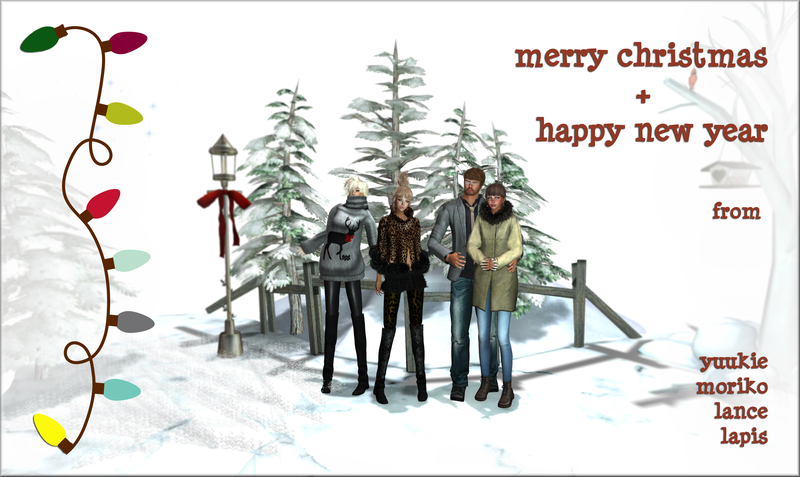 This entry was posted in Freebies and Gifts, Product Announcements on December 1, 2012 by moriko.